Questions about equipment and supplies to bring on a trip (including reviews). Headed to the island the last week of June for 6 nights and am looking for some advice on what makes more sense to hike in? Would it be buggy/rainy/ overgrown enough that you would wear pants and just deal with the heat or shorts and gaiters? I always wear "zip-off" pants to adapt to the conditions quickly. Along the big lake and on ridge tops, there are many days without bugs if the wind is blowing at all. Plus, I hike in shorts often with or without gaiters. "Half the fun is in the planning"
Thanks for the insight! Would you all normally wear gaiters this time of year due to mud or do you usually skip gaiters? From the greenstone. I was happy to have them. Also from the Greenstone--Mt Franklin, to be exact. there's no stopping me now---here's ANOTHER photo. 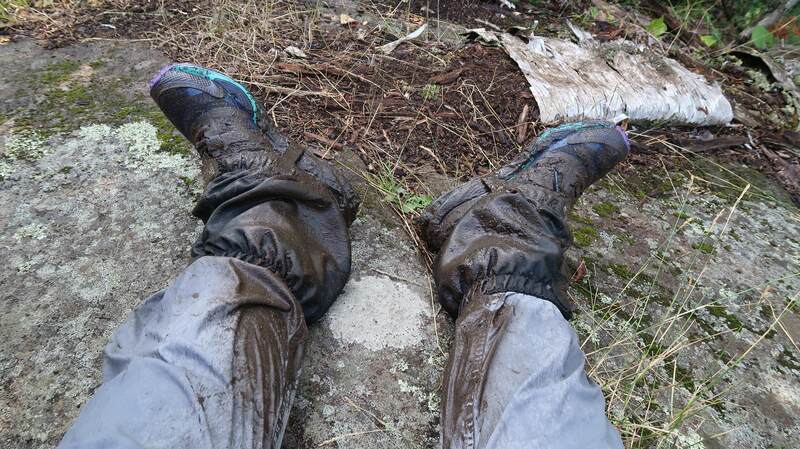 Same gaiters, different circumstances. I'm a shorts guy and then wear my rain pants if the bugs are bad or if it's too chilly for shorts. Gaiters if it's wet (rain or heavy morning dew). It's not a good back country trip unless you come back with scratches on your legs. Piggybacking off of this thread,what about synthetic tights? I hiked the island for 5 days last May wearing synthetic tights and a long sleeve synthetic shirt. I sprayed all of my clothes with permethrin and had almost no problems with bugs at all. Maybe the permethrin was magical, or maybe I just got lucky? I will be going back this July, and I am hoping for a repeat experience. I'm sure flies or mosquitoes will be able to bite through the fabric, but the permethrin should offer protection, and if it gets really bad, I can always put on my rain gear. Would some light pants and a light long sleeve shirt be worth the extra pack weight? I'd worry about the bitey things biting through the tights. Usually the bugs aren't out in force in May, so it might be hasty to extrapolate the success of the permethrinned tight strategy to July. I am just back from 6 nights on the island. The mosquitoes where just coming out and I heard of one black fly bite. nights were in the low to mid 40s. I always wear long pants just for the bugs. Been going back and forth over gaitors - never used them. Of course it's too late to order anything. Will they really make a difference? And is there a brick and mortar somewhere in Michigan along the way to the UP? I pass cabelas in Dundee (near Ann Arbor) heading north, but I highly doubt they carry. Found an rei in Ann Arbor. But do I really need to spend another 120 bucks - I'll be eating beans and rice for the rest of the year as it is already.